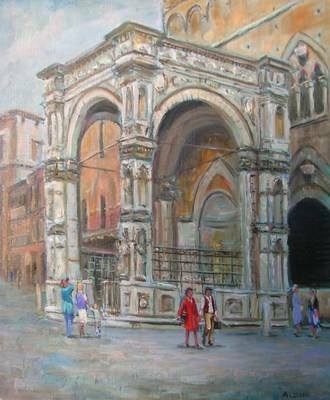 MAGNIFICENT ORIGINAL HIGH PRESTIGE OIL PAINTING "Arco di Siena". BY THE FABULOUS ARTIST DAVID ALDUS U.A. A truly superb painting painted en plein air in one of David's trips to Italy. ................. Highest price received for one of his paintings is £20,000 "Armada under attack" & £14,000. "Lot's Wife" Absolute investment opportunity! Siena has a fascinating history! A Roman town called Saena Julia was founded at the site in the time of the Emperor Augustus. The first document mentioning it dates from AD 70. Some archaeologists assert that Siena was controlled for a period by a Gaulish tribe called the Senones. The Roman origin accounts for the town's emblem: a she-wolf suckling infants Romulus and Remus. According to legend, Siena was founded by Senius, son of Remus, who was in turn the brother of Romulus after whom Rome was named. Statues and other artwork depicting a she-wolf suckling the young twins Romulus and Remus can be seen all over the city of Siena. Siena is an important religious and cultural centre and has long associations with the Renaissance with Artists like Sano di Pietro and his famous painting "The Virgin appears to Pope Callistus III" telling the story of a terrible famine that hit Siena in 1455 and the Pope saving the town after the Virgin Mary appeared to him in a vision!!!! David Aldus the artist has exhibited with the Royal Society of British Artists ( R.B.A ); the Royal Institute of Oils (R.O.I); and the Royal Society of Marine Artists (R.S.M.A) He has been nominated twice as a finalist in the Garrick/Milne prize exhibition held at Christies LONDON. His work has been selected for the Discerning Eye Exhibition by Art Critic, Edward Lucie Smith, where all his work was sold. At the same Exhibition he was awarded a special commendation for his brushwork. He also sold all his work at the Lambeth Palace when exhibiting under the auspices of the Royal Society of Marine Artists. At the Westminster Central Hall United Artists' Exhibition he won first prize for the best Oil painting!! Highest price received for one of his paintings is £20,000 "Armada attack from the English Fleet". Also £14,000. "Lot's wife" see davidaldus.com . This painting was the same size as Turner's Hannibal crossing the Alps 5 foot by 8 foot. David Aldus also sold "A tribute to the people of Malta" that sold for £10,000. The same painting was the subject of a congratulatory letter from Queen Elizabeth II. Lord Lewin, Admiral of the Fleet also sent a letter of congratulations. He has held one or two-man shows at Knightsbridge; South Kensington; Windsor and numerous other venues. He has exhibited in Westminster Central Hall; Royal Festival Hall; Birmingham’s Royal British Artists exhibition; Victoria Art Gallery, Bath; Rooksmoor Gallery, Bath; London Guildhall; Mann Island, Liverpool; Christies, the London Auction House, etc.